The spacecraft’s next orbit, its 287th, August 4 through the 10th, will pass one of the odd gashes or "propellers," in Saturn’s vast ring disk. NASA scientists first spotted the anomalies in 2004, and they assumed football field-sized moons hidden amid the planet’s vast, iconic rings were responsible for creating the three-mile long slashes. In the images, however, they couldn’t find evidence of any such diminutive space rocks. A close flyby in the coming week may reveal these supposed moonlets. 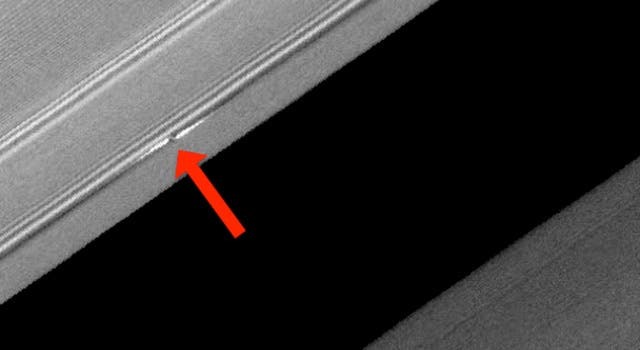 When first observed thirteen years ago, Cassini researchers concluded that the propeller gashes “are much like the wave pattern that trails after a speedboat as it skims across a smooth lake.” But, Saturn’s rings are more varied and uneven, like a “choppy sea,” which would make the gashes exceedingly difficult to detect. Scientists using NASA's Cassini spacecraft at Saturn have stalked a new class of moons in the rings of Saturn that create distinctive propeller-shaped gaps in ring material since they were first discovered in 2010, which marked the first time scientists were able to track the orbits of individual objects in a debris disk. The research gives scientists an opportunity to time-travel back into the history of our solar system to reveal clues about disks around other stars in our universe that are too far away to observe directly. "Observing the motions of these disk-embedded objects provides a rare opportunity to gauge how the planets grew from, and interacted with, the disk of material surrounding the early sun," said Carolyn Porco, Cassini imaging team lead based at the Space Science Institute in Boulder, Colo. "It allows us a glimpse into how the solar system ended up looking the way it does." Research led by Matthew Tiscareno, a Cassini imaging team associate at Cornell University, Ithaca, N.Y., revealed a new cohort of larger and rarer moons in another part of the A ring farther out from Saturn. With propellers as much as hundreds of times as large as those previously discovered. NASA scientists estimate that there are dozens of these giant propellers, and 11 of them were imaged multiple times between 2005 to 2009. One of them, nicknamed Bleriot after the famous aviator Louis Bleriot, has been a veritable Forrest Gump, showing up in more than 100 separate Cassini images and one ultraviolet imaging spectrograph observation over this time. "Scientists have never tracked disk-embedded objects anywhere in the universe before," Tiscareno said. "All the moons and planets we knew about before orbit in empty space. In the propeller belts, we saw a swarm in one image and then had no idea later on if we were seeing the same individual objects." The giant propellers have shifted their orbits, but scientists are not yet sure what is causing the disturbances in their travels around Saturn. Their path may be upset by bumping into other smaller ring particles, or responding to their gravity, but the gravitational attraction of large moons outside the rings may also be a factor. –During this orbit Cassini’s Ultraviolet Imaging Spectrograph (UVIS) observes Saturn’s northern aurora, attempting to capture the entire auroral oval over several observations. –The spacecraft’s imaging cameras, the Imaging Science Subsystem (ISS), performs the first of two final observations of one of Saturn’s tiny, irregular moons, named Kiviuq, which completes about 80 percent of one rotation during Cassini’s observation. The observation is intended to improve models of the moon’s shape and other of Kiviuq’s characteristics. –The ISS instrument also targets one of Saturn’s ring propeller features, and also continues its campaign of observing Saturn’s moon Titan for two segments of time, each lasting several hours, to image the moon’s atmosphere and surface, in particular to watch Titan’s clouds form and change. –The spacecraft’s Composite Infrared Spectrometer (CIRS) and Visible and Infrared Mapping Spectrometer (VIMS) observe Titan as well. –Also during this orbit, the spacecraft rolls to calibrate Cassini’s magnetometer (MAG). During this orbit, Cassini gets within 1,830 miles (2,940 kilometers) of Saturn’s 1-bar level. Cassini also passes within 2,960 miles (4,760 kilometers) of the inner edge of Saturn’s D ring. If Saturn's elusive moonlets do exist, they are tiny, totally unlike Titan, the planet’s largest moon that orbits beyond Saturn’s ring disk. During orbit 287, Cassini will have a chance to further investigate Titan's clouds and surface with its thick nitrogen atmosphere with wispy methane clouds. Titan is the only known world outside our own that contains bodies of liquid — with its lakes of methane. 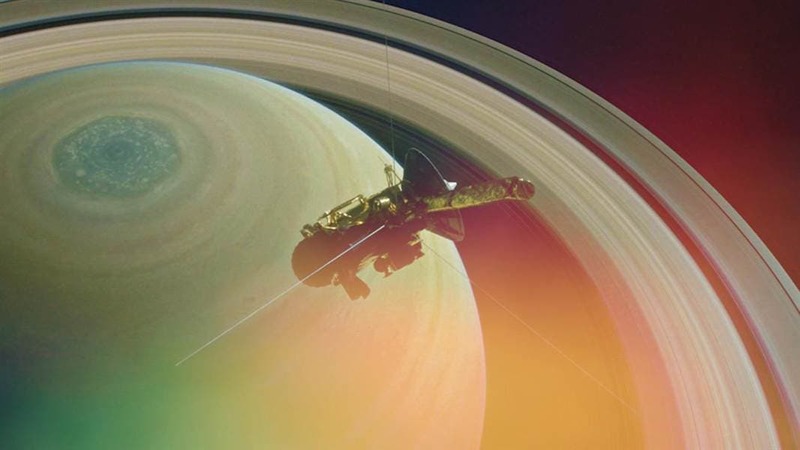 Cassini will also study Saturn’s northern aurora. Much like Earth’s auroras, these are extravagant light shows caused by energetic particles from the sun slamming into Saturn’s upper atmosphere. After orbit 287, Cassini will have just six missions left. It will drop into Saturn’s heavy atmosphere on September 15, destroying any evidence of having spent years orbiting the planet and its many moons.